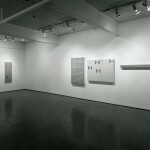 Mercer Union is pleased to present the first North American exhibition of work by German painter Helmut Dorner. 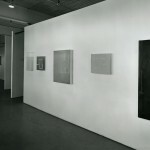 The exhibition Helmut Dorner Under the Surface is curated by Gregory Salzman and will be traveling to the Contemporary Art Gallery in Vancouver in April, 1994. Helmut Dorner’s abstract paintings reaffirms a deep-seated need for art which goes well beyond its role as an agent of social change. What is at stake is a more far reaching conception of art–one which considers it in terms of human creativity. Abstraction, through its continual quest for a form, can keep us rooted to the moment of looking, that is to a moment continually to be repossessed and with no specific end (or object) in sight. Dorner’s art, by virtue of its performative temporal basis incorporates elements of risk, unpredictability and uncertainty that are sine qua nons of creativity. Mercer Union is publishing a catalogue in conjunction with this exhibition with essays by Gregory Salzman and Alain Cueff which will be available in April, 1994. Published by Mercer Union and the Contemporary Art Gallery, Vancouver, 1994. Helmut Dorner’s art engages us in a close and sustained process of looking that entails a certain stringency and clarity but also a degree of uncertainty and indeterminacy. His art is not bound by any aim or purpose but, true to the nature of perception itself, remains always contingent and mutable. Through his art one discovers a certain calmness within a fragmented, differentiated field. The unity of each work is unstable. Each work remains open to further conjugation. While the paintings in no way represent the world or things in it, their tension between autonomy and connectedness suggests they are analogues for individuals whose identity is always changing and at risk. Structurally, the paintings are complex. They are composed of many different elements whose interaction is also complex. The paintings are not preconceived but are formulated through a process whose outcome is largely unpredictable. Each additional element modifies the state of the system and suggests or stimulates a further reaction. The lacquer paintings are built up layer by layer. Each successive layer obscures the prior state of the painting and offers the possibility of altering the com position. In every work there is a meshing of the disparate elements: drawing, colour, surface, space. Given the multiplicity of the possible elements and their permutability, the number of possible relation ships and final configurations is staggering. An excess of possibilities is an inherent part of the process of making and also of interpreting the works. The presence of this proliferation of choices and the absence of foundational structures constitute the contemporaneity of Dorner’s art. In this context, the formality of his work satisfies a need for limitation. A tension exists between his art’s formality and its lability. The entire process of seeing in which Dorner is engaged involves many opposing tendencies, and his art by turns may be seen as conservative or radical, classical or romantic, intellectual or emotional, reflective or spontaneous. 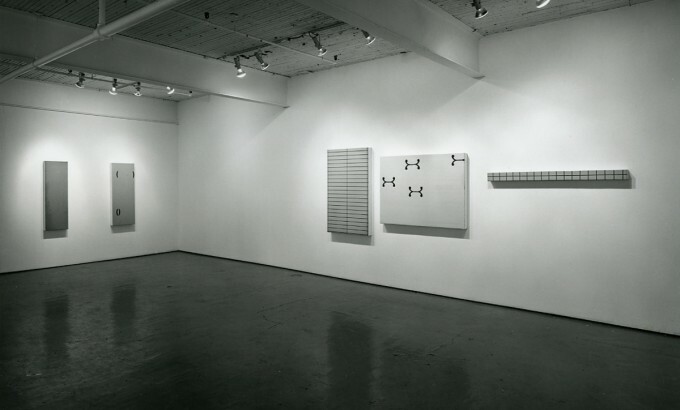 Dorner’s art, through its pervasive lability, is inherently nonideological. It registers tendencies within, and perturbations to, a system but is incapable of postulating an axiomatic systemic framework. A paradigmatic vacuum underlies its uncertainty. To function in a situation marked by the absence of givens held as self-evident calls for a reliance on one’s intuitions and a trust in one’s empirical observations. Under these circumstances, categorical thinking and deductive reasoning from premises is incapacitated. Inductive and analogical modes of thought that are more intuitive, approximative, and supple are better able to portray change and to embrace paradox. These are the modes that Dorner favours. Through its many fine calibrations, gradations, and nuances, Dorner’s art multiplies the distinctions between things but also produces harmonies and correspondences among them. The incessant variations of, adjustments to, and coordination of colour, composition, shape and interval, surface and depth in his art are tokens both of a condition of doubt and a pursuit of objectivity. Dorner’s preoccupation with the skin of things is also a gravitation towards limiting conditions where identity affirms itself as a play between similitude and difference. The surfaces of his paintings are boundaries that mediate between shape as a container and colour as an atmospheric, energetic field. The pictorial fields always approach flatness but the skins generally have a concrete bas-relief dimensionality. Sometimes the figures are embedded in the surface like fossils in a congealed matrix. Other times, they are present as cutouts that expose a substratal layer of colour. In some cases a halo of substratal colour bleeds through the skin or traces of underlying configurations appear on the surface as almost imperceptible depressions in it. In contra distinction to the pictorial flatness of the fields, to the concrete dimensionality of the surfaces, and to the objecthood of the paintings, the location of the figures and their ghosts in space is imprecise. In the lacquer works, although the figures are generally oriented along rectilinear coordinates, their arrays are loose and the individual elements tend to drift and wobble. The surfaces of Dorner’s paintings are very physical yet equally transformative. They equivocate between tactility and opticality, solidity and liquidity. In the case of the lacquer works, one is very conscious of the process, namely the pouring and spreading of the lacquer material across a flat horizontal surface. Light and one’s gaze move across the almost smooth yet gently inflected surfaces with a slow, continuous motion. The abrupt, static, instantaneous perception of a definite gestalt is undermined by a gradual shift of focus and a more durational quality. The imperfections of the surface, the imprecision of the con tours of the indented figures, and the irregularity and eccentricity of the compositions function as impediments that slow down the reception of the work. They soften and qualify the monolithic, static nature of the object and produce friction and a warmth. The accidents that are a part of the works’ physical process introduce a personal and natural element into the work, as well as an element of risk and unpredictability. The rigidity and physicality of the surface are dissolved by a diffuse spatiality that brings the work to life. This spatiality has a kinesthetic component and is linked to the inference of movement. The sensation of movement in an object is always mysterious. 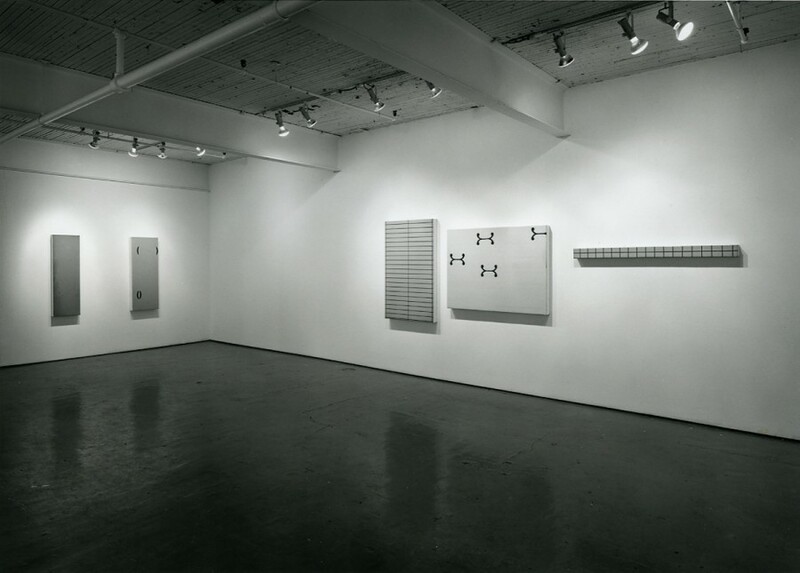 There is a dialogue in Dorner’s work between clarity and imprecision, shape and atmosphere on all its levels. Spatiality here is not illusionistic but abstract, or, more accurately, abstract (mental) space and concrete space impinge on each other. Chromatic relationships affect the perceived dimensions, mass, and spatial location of the elements within a single painting and of one painting in relation to another. Spatial ambiguity is produced through subtle tonal variations and chromatic resonance, even between noncontiguous elements. Colour functions both as an attribute of a thing but also as a neighbourhood or atmosphere. Dorner’s palette consists of complex tonal blends and tints that are singular yet elusive. Their brokenness and indefiniteness make them especially susceptible to further modification and conjunction where more definite, purer hues would be less labile. The tonal relationships in a painting also vary with the changing conditions of illumination and with the ambient reflections. This occurs especially in the lacquer paintings, whose reflective surfaces act as imperfect mirrors. Virtually all of Dorner’s compositions extend implicitly beyond their frames. The framing and cropping of the compositions are somewhat arbitrary. The frame of vision tends to shift and to expand. As the frame of vision and the focus shift, different relationships and unities are brought into view. The implication of this mobility is that the coherence of what is seen at any given moment depends on the temporary exclusion of what lies beyond the field of vision. Ultimately, the status of each element within the system and the precise terms of its interactivity with all the others are neither predictable nor determinate but need to be reevaluated continually through experience. 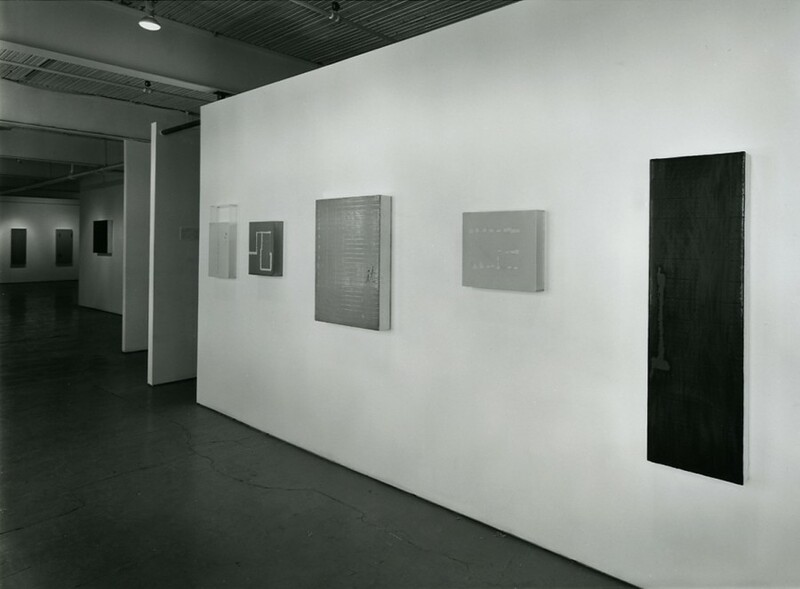 Dorner’s practice of grouping several autonomous works into a larger work is a singular and innovative one that flows naturally from the other terms of his art. 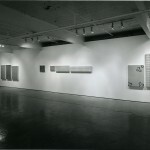 Initially all the panels are painted as indiviual, self-contained works. It is never apparent at the outset which paintings will be incorporated later into an ensemble. The coupling of two or more works occurs partly spontaneously, partly through a process of trial and error. Through these ensembles the unity of the individual painting is challenged, relativized and redefined at a new level of complexity. The ambiguity between figure and ground in the single panels is extended in the ensembles, where the individual panels themselves function as figures in relation to the wall as ground. The figures in Dorner’s art and the elliptical, fragmentary titles entail a semantic potential that is never fully realised. Together they emblematize the copulative, processual, generative nature of the entire work. Structurally, the figures affirm the picture plane and deny an illusionistic depth. They support a play between immediacy and duration, flatness and depth, stasis and movement, repetition and change. They organize the pictorial field through cadence.2 The rhythmic, syntactical articulation of solid elements and intervals is especially evident in the case of the ensembles and in the overall sequencing and spacing of works on the gallery walls. The fluctuating, multiple tendencies within Dorner’s art are articulated and given scope through the range of materials and processes he em ploys. The oils, the lacquers, the larger multipartite works, the smaller lacquer works, and the hybrid, lacquer-plus-oil works are distinct but affiliated types of work within the entire oeuvre. They each articulate different possibilities and dimensions of experience. The oils, in which the colour is mixed directly on the panels, have a maximal tactility and viscerality. The lacquers, by virtue of their process, are more intellectual and deliberative, less responsive and flexible, than the oils. The larger lacquer works such as TEL, in contrast to the smaller ones such as GREE, are more formalized and possess a more public aspect, whereas the latter are closer to drawing. The smaller individual works in this exhibition are more fluid, gestural, emotional, and personal. The works on plexiglass, in turn, possess a vibrancy of colour and luminosity that is not attainable in the other formats. Onge, one of these plexiglass works, combines the spontaneity and deftness of Dorner’s drawings with the solidity, depth, and fullness of the larger lacquer works. UM and RUF, two of the ensembles in this exhibition, are examples of works using hybrid techniques. A few final accenting strokes or blips of oil paint are applied over the embossed lacquer surfaces. In a sense these final steps bring the paintings full circle–they began with drawing and end with drawing. These final strokes place the closure of the work at risk. They conclude the work by reopening it. TR also has an implicit circularity. It sets up a continuous scanning motion from left to right, effected by a gradual diminution of physicality and a lateral, tonal shift and diffusion. Through a chromatic correspondence between the final and the first panel, one’s gaze rebounds from the one back to the other and the circle is closed. The coherence of the work depends, as in UM and RUF, on a final adjustment to the lacquer panels’ surfaces. In this case, they have been partially sanded. Sanding the intact, shiny surface of a finished painting goes against the grain. Paradoxically, this aggravating gesture serves the interests of refinement and unity. Through sanding, the physicality of the lacquer surfaces is de-emphasized. A milky vagueness is produced that corresponds to constituent tones in the first oil panel. Sanding here enhances both the transformativity and the unity of the work. Considered in its entirety, both visually and procedurally, the painting is an anomalous entity that incorporates elements of risk and harmonisation. Its configuration is unorthodox and eccentric; its procedures entail a certain pragmatism; its movements involve a certain softening and blending of differences. Dorner’s art, through its refinement and tranquillity, its union of surface and depth, form and flux, and its synthesis of self-reflection and selflessness, has affinities with Eastern modes of thought. It has a traditional aspect but also a capacity for self-renewal. It discovers new complexity, resources, and potential within an existing language. There is a side of Dorner’s character and activity that contemplates the just relation among things and another more impulsive side that is impatient with facile formulations and conventional solutions. No sooner does a harmonic relationship propose itself than its destabilisation is sought. This process of resolution and dissolution goes on until a point of rest is found in another, more unstable and complex state. Dorner’s art enables us to see more accurately and more amorously. More accurately, by virtue of an agreement between what it says and what it does; more amorously, because, paradoxically, in moving us to a slower pace it quickens us. Through a certain release from aims and attachments it connects deliberation and delight. 2. Cadence is used here in its musical connotation. The term “cadency” or “cadency mark” also applies to heraldic signage, where it refers to small changes or minor differences in a coat of arms that denote familial relations and lineages. Dorner’s early lacquer paintings often resembled banners bearing emblems. This other aspect of cadency is potentially revealing in view of his art’s cross-referencing of disconnected bits of information, of its micrological differentiations and, ultimately, in terms of its contention, on a symbolic level, with a general loss of coordination of social institutions that challenges the viability of symbolic communication itself. This catalogue is published on the occasion of an exhibition curated by Greg Salzman and coordinated by Mercer Union. Mercer Union, Toronto February 17 – March 26 , 1994. 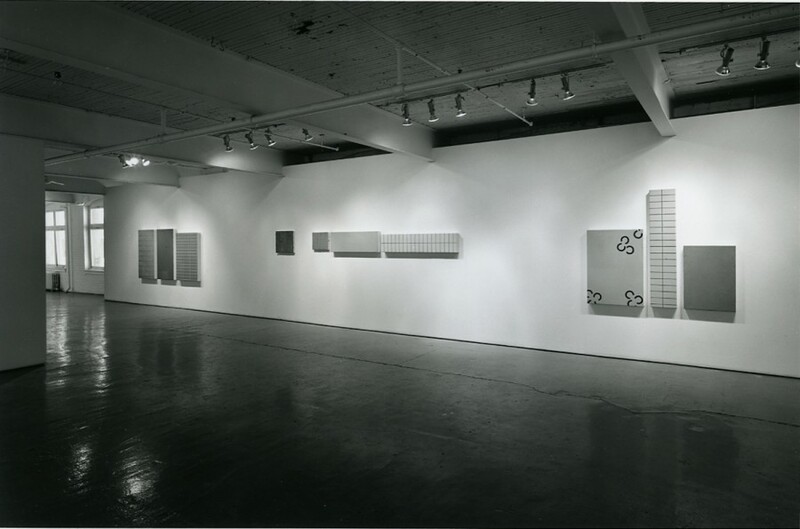 Contemporary Art Gallery, Vancouver April 16 – May 21, 1994.